There aren’t any Trader Joe’s in my area, so this edition of Food In Real Life comes to you courtesy of reader Emily Tanoury. Thanks Emily! This post is filed under Corn, Dry, Green Onions, Microwave, Mushrooms, Pasta, Reader Submission, Trader Joe's. I think I would have given it a bit lower than 3 of 5 for looks. Even if the ingredients never listed corn, the picture is deliberately misleading. Glad it tasted good, though! Seriously? That tasted good? I don’t think I could bring it to my mouth. 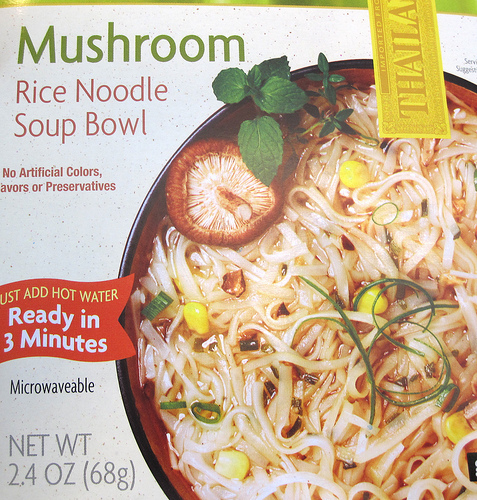 While it’s true that it didn’t include any corn (or the sprinkling of fresh-looking scallions it shows in the picture), the words “serving suggestion” do appear above the picture (albeit in pretty small letters), so I guess they can take some license there. Speaking of serving suggestions, I added a couple of ounces thinly sliced leftover cooked steak that I had from the night before to the soup and it complemented it beautifully — even better than I expected — and the added protein made it seem more substantial and “rib sticking.” I would definitely do that again! How can the looks be 3 out of 5?! Not only is it barely like the box picture, it looks like a backed-up toilet full of paper at a truck stop, complete with indiscriminate splashing around the rim. I’m no snob and would try most of this stuff, but I think you go too easy on the looks on almost every item. I need more vitriol in my packaged-food criticism! Now, now… Let’s not get carried away. This was a reader submission, and the Food IRL community is not as jaded and negative as I am (thankfully). Made the spring onion flavor today, by adding boiling water rather than microwaving. Maybe this was Emily’s problem with the lack of broth? 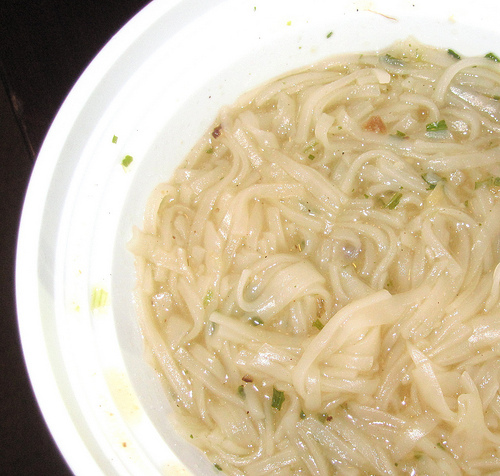 My noodle boll was really good. Like everyone has said, there’s no corn, but the broth is spicy in the best way possible, and considering that it’s nothing but broth and rice noodles, it was very filling. These are a savior for college students. I am on campus for more than 8 hours a day and cant afford the overpriced on campus options. At my work I use the hot water in the water cooler let it sit and enjoy a filling and tasty meal. Beats top raman and souper bowl!! Err…why do you eat this ‘stuff’. I’m not going to call it food.